Many people choose to make their own clothes not simply to save money but more often because they feel that either current high street trends do not reflect their preferred styles, that the size ranges of the clothes in stores do not cater to their needs and/or the quality of the materials used are not worthy of the price tags. Then there are those who like what they wear to express their own sense of individuality. Additionally, there are thousands of people who will design and manufacture clothing items on a small-scale basis as a way of supplementing their income. Some even turn it into a part-time or even full-time occupation. So, whatever your motivation, there are numerous courses out there which cater to all levels from beginners to more advanced dressmakers which will equip you with the skills and knowledge to produce your own dresses, skirts, blouses, trousers etc. and even bridal wear. You can undertake beginners’ courses from City & Guilds Certificates in Design and Craft at levels 1 through 3 or ABC Sewing & Textiles at levels 1 and 2 and Pattern Cutting at level 3. These courses should be available through your local college, night school or via another education provider close to where you live whilst many library notice boards will often feature advertisements on postcards posted by private individuals who will teach you some of the basic skills without it necessarily leading to a recognised qualification. Providing you have the appropriate tools and equipment, you can also undertake some of these courses through distance learning programs. Once you have mastered the basics, there are also NVQs to level 2 in Manufacturing Sewn Products and to level 3 in Apparel Manufacturing Technology and these courses will be invaluable if you’re intending to set up a small business as a dressmaker. If that whets your appetite, then you might also go on to even higher education and study for a relevant BTEC or HND qualification or maybe even consider undertaking a degree course in something like fashion and textile design. The courses will obviously differ in some respects but generally they’ll teach you how to adapt an existing pattern or how to produce a new pattern and how to use that to cut out and then piece together the fabric pieces. You’ll learn how to discuss a client’s requirements so that you can show them a range of fabric samples from a pattern book and how to take measurements accurately. And, if you’re going to be doing this as a profit-making venture, the courses will also show you how you can work out the retail cost of a particular garment, based on the type of fabric and any embellishments or trimmings that might be required as well as factoring in labour costs. You’ll also learn how to operate a sewing machine as well as learning how to apply the finishing touches by hand. And, even if you do not feel ambitious enough to create a new garment from the start right through to the finished article, many people have carved out a steady additional income stream for themselves by undertaking one of these courses and then offering alterations and repairs services, e.g. 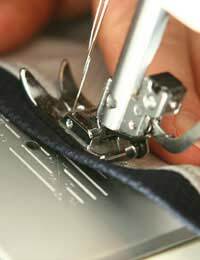 replacing a zip on a jacket or pair of trousers to putting hems on dresses or shortening the leg lengths of trousers. Your local college or education provider should be able to give you further details of which courses are available in your area and the learndirect website is a useful additional source of information. Please can you send me further information in regards to your dressmaking courses along with the NVQ's relating to dressmaking. Interested in a distance learning/online sewing course. Send me the relevant information including fees ASAP please. Please can someone give me more information on how to do Courses from home as I have just had another baby and Would like to take up a new course.